The flower fades that is not looked upon the old maxim goes. 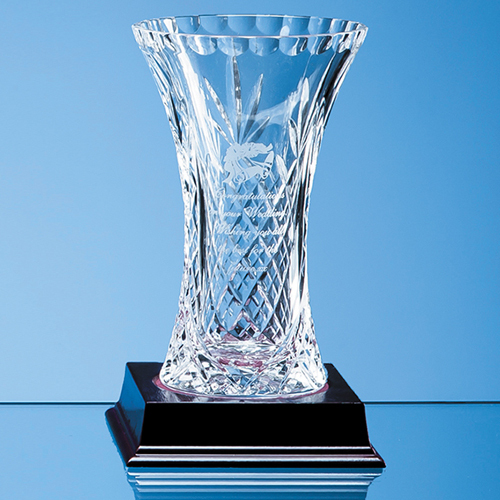 So make sure you gaze often on flowers in this stunning 15cm lead crystal panelled flared vase. Beautifully embellished with a diamond and wedge cut pattern it is available in three sizes (15cm, 19cm and 23cm) and with space to engrave a special message, logo or crest it doubles as a corporate recognition award, sports or 1st, 2nd or 3rd prize trophy or as a memento of a special event or occasion - whether a birthday, retirement, anniversary Available as an option is a beautiful presentation box with blue satin lining. Optionally available also is a 7.5cm recessed wooden base (MOR22) to stand it in.